Whether you are looking for sleek pendant lamps or cosy floor ones, Light & Living in HSR will sort you out with its big range of lighting. And there’s three floors of lighting to choose from. Located on HSR’s Outer Ring Road, you will not miss this store, because three storeys of a beautifully lit store is hard to miss, especially at night. Whether you are looking for a glitzy chandelier for your new restaurant or a functional pendant lamp for your bedroom, Light & Living has something for everyone. And everything is priced at reasonable rates too. You can even get your basics such as different kinds of CFL bulbs and tubelights here if you are setting up home. Once the basics are sorted, now begins the hunt for the right lighting fixtures and lamps for your home. While their floor and table lamps come in modern and sleek designs, they also offer lighting for bathrooms, for display and picture lights, and outdoor landscape lights. Though the chandelier section comes with the usual suspects, we suggest you check out their modern versions, like this one, which will look swanky in your living room or this fibre wood pendant light for your dining space. You can get fancy lights and lamps starting at just INR 1,000 and for basic bulbs and tube lights, it begins as cheap as INR 100. 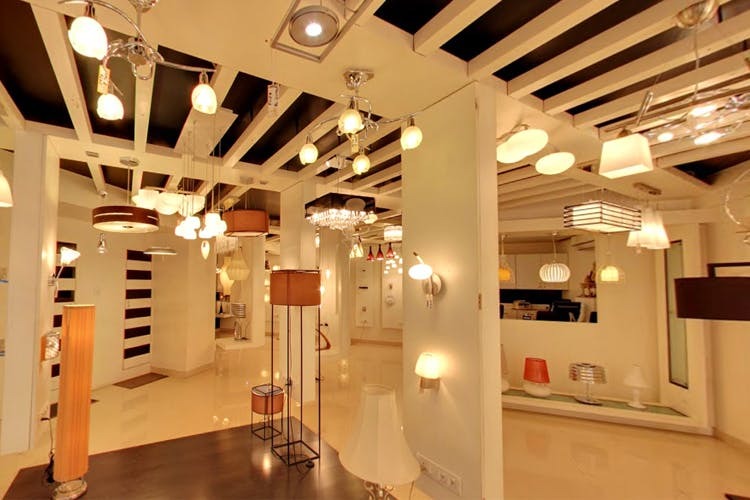 These guys also offer a consultation service, where a lighting expert can visit your home and help you choose your lamps and lights according to your space, aesthetics and preferences.